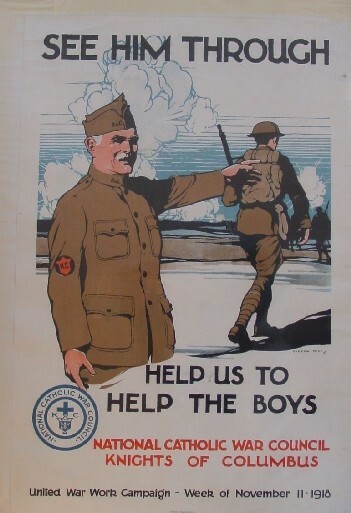 Comments: This World War One poster is unique because it is for a fund raising campaign for the week of November 11, 1918 and the cited date is the day the war ended with the Germans signing the Armistice document! Nevertheless the message was still relevant because the boys were still "over there" and needed help to see them through until their return. The sponsor of the poster was the Knights of Columbus United War Work Campaign. Condition: Very good with one repaired edge tear.